Federal Reserve officials will meet on September 25-26 to set monetary policy. It’s widely expected that the Federal Open Market Committee will raise the federal funds target range by another 25 basis points, to 2.00-2.25%. The four Fed governors and twelve district bank presidents will also submit revised projections of growth, unemployment, and inflation, extending out to 2021. 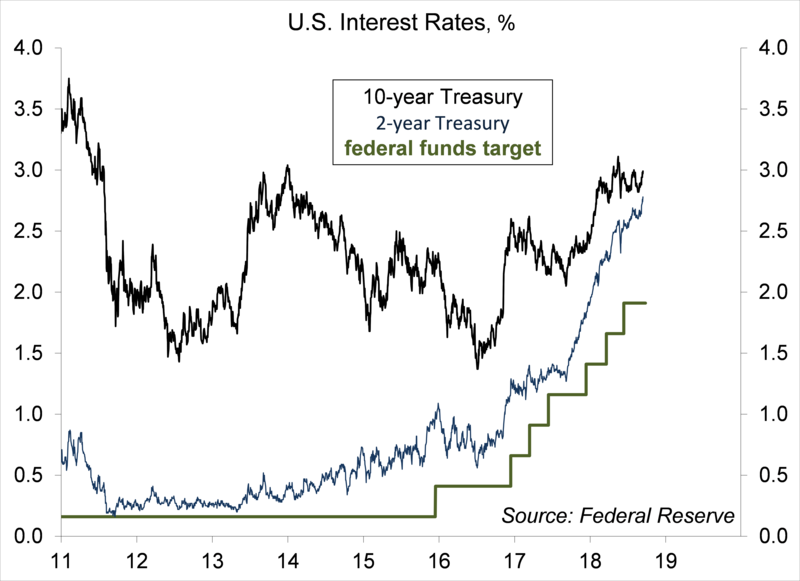 This will include a refreshed dot plot (the individual officials’ expectations of the appropriate level of the federal funds rate for the end of each of the next few years). There will be some range in opinions, but we ought to see more of a consensus for the near term. Of course, monetary policy decisions will remain data dependent. Minutes of the July 31-August 1 FOMC meeting showed that officials “generally expected that GDP growth would likely slow from its second-quarter rate but would still exceed that of potential output.” Data received since that meeting confirm that view. “Many participants suggested that if incoming data continued to support their current economic outlook, it would likely soon be appropriate to take another step in removing policy accommodation.” The minutes showed some concerns about trade policy, but worries had not had a significant impact on capital expenditures. Business expectations remain generally robust. Hence, barring some catastrophic external event, the FOMC is almost certain to raise rates on September 26. In his Jackson Hole speech (August 24), Fed Chair Powell indicated that officials are well aware of the risks of moving too rapidly on rates or too slowly, as is the case whenever the economy nears full employment. At the heart of the debate is the notion of the natural rate of interest, the rate consistent with output growing around its potential rate (around full employment) and stable inflation. In a speech last week (September 12), Fed Governor Lael Brainard split the concept into a short-term neutral rate and a long-term rate. The short-term rate fluctuates with economic conditions. Towards the end of her tenure as Fed Chair, Janet Yellen spoke of Fed policy nearing the neutral level, but cautioned that the (short-term) neutral rate would naturally rise as the economy improved. 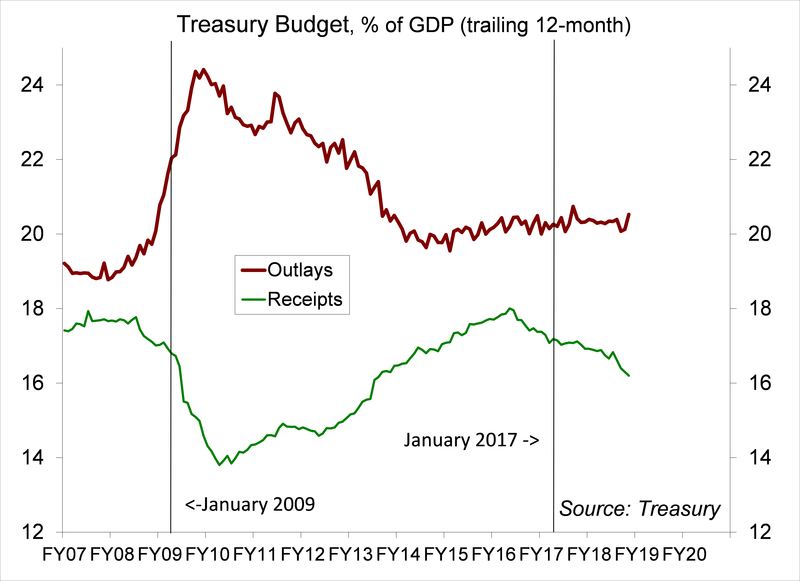 Currently, fiscal stimulus represents a significant tailwind for the economy, pushing the short-term neutral rate higher. Hence, the Fed is expected to remain in tightening mode after raising rates on September 26. In setting monetary policy, Janet Yellen was in tune to a wide range of labor market indicators. In particular, as the job market tightens, workers become more confident about finding new employment and are more likely to quit to pursue other opportunities. For much of the economic recovery, the quit rate had been relatively subdued. However, it has now risen to the highest level since early 2001. That is consistent with other labor market measures suggesting much tighter conditions. Initial claims for unemployment insurance have reached a multi-decade low in the last couple of weeks. For many Fed officials, faster wage growth is a long-standing concern for consumer price inflation. However, that depends on whether firms are able to pass along higher labor costs or whether higher labor costs can be offset by increased output per worker. Faster wage growth could lead to a reallocation of labor over time. The late 1990s were a transformative time for the U.S. economy, reflecting the introduction of new technologies (cell phones, the internet). Job destruction was elevated, but job creation was even stronger. Fed Chair Alan Greenspan challenged the conventional wisdom at that time and led the central bank to keep rates lower than they would have been otherwise. However, that accommodation was seen as partly fueling the dot-com bubble. So, even if the inflation outlook remains moderate, the Fed may continue to tighten if officials believe that financial excesses are building. All expressions of opinion reflect the judgment of the Research Department of Raymond James & Associates (RJA) at this date and are subject to change. Information has been obtained from sources considered reliable, but we do not guarantee that the foregoing report is accurate or complete. Other departments of RJA may have information which is not available to the Research Department about companies mentioned in this report. RJA or its affiliates may execute transactions in the securities mentioned in this report which may not be consistent with the report’s conclusions. RJA may perform investment banking or other services for, or solicit investment banking business from, any company mentioned in this report. For institutional clients of the European Economic Area (EEA): This document (and any attachments or exhibits hereto) is intended only for EEA Institutional Clients or others to whom it may lawfully be submitted. There is no assurance that any of the trends mentioned will continue in the future. Past performance is not indicative of future results.